To Cite: Wang C, Li Y, Shen C. Epstein-Barr Virus Infection Mimicking Drug-Induced Hepatitis in a Critically ill Patient During Antituberculosis Therapy, Hepat Mon. 2014 ; 14(9):e18865. doi: 10.5812/hepatmon.18865. Introduction: Although hepatitis is frequently observed during antituberculosis (anti-TB) therapy, acute viral hepatitis should be ruled out first, especially in the endemic areas. In addition to common types of viral hepatitis, ie, hepatitis A, hepatitis B, and hepatitis C viruses, Epstein-Barr virus (EBV) may result in hepatitis in some cases. Case Presentation: Herein, we reported a critically ill patient who developed cholestatic hepatitis in the intensive care unit during the anti-TB therapy, which was misdiagnosed as anti-TB agents-induced hepatitis in the beginning. Further serologic tests and liver biopsy confirmed the diagnosis of EBV hepatitis. In contrast to previously reported hepatitis by EBV, which had presented with transient liver dysfunction and self-limiting illness, hepatitis with progressive jaundice was followed by coagulopathy and encephalopathy in our case and the patient died of hepatic failure complications. Conclusions: According to the presented case and subsequent literature review on fatal EBV hepatitis, clinicians should consider EBV infection in the differential diagnosis when hepatitis occurs in critically ill patients during the anti-TB therapy. Although hepatitis caused by EBV is mostly self-limited, some might be fetal. Epstein-Barr virus (EBV), a member of the Herpesviridae family, infects the majority of the young adult population and manifests as infectious mononucleosis (IMN) (1). Hepatic involvement presents mostly with self-limited elevations of aminotransferase levels in 80% to 90% of cases of IMN and resolves spontaneously with supportive treatment. Clinical jaundice and hepatic failure are rare (2). Herein, we report a critically ill patient with active pulmonary tuberculosis (TB) who developed fetal EBV hepatitis during anti-TB therapy. An 88-year-old man was referred to our institute for prolonged fever and productive cough. Within two hours of arrival in the emergency department, respiratory distress developed. Endotracheal intubation was performed and then he was admitted to the intensive care unit (ICU). Past medical history was unremarkable. He had smoked one pack per day for 50 years without any alcohol consumption. Initial laboratory studies revealed aspartate transaminase (AST) level of 36 U/L (reference, 4-45 IU/L), alanine transaminase (ALT) level of 18 U/L (reference, 5-50 IU/L), alkaline phosphatase (ALKP) level of 100 U/L (reference, 44-147 IU/L), and gammaglutamyl transpeptidase (GGTP) level of 32 U/L (reference, 0-50 IU/L). Additionally, total bilirubin level was 0.9 mg/dL (reference, 0.3-1.2 mg/dL) and peripheral white blood cell (WBC) count was elevated (16.9 × 109/L, with 67% neutrophils and 9% bands). Blood urea nitrogen and creatinine levels were 16 and 1 mg/dL, respectively. An ill-defined opacity in the left upper lung was seen in chest roentgenogram. Microscopic examination of sputum was positive for acid-fast bacilli and a subsequent culture yielded Mycobacterium tuberculosis. Pulmonary infection with M. tuberculosis was diagnosed and standard therapy with isoniazid, rifampicin, ethambutol, and pyrazinamide was administered. Repeated pneumonia and persistent positive acid-fast bacilli in the sputum after starting antituberculous therapy convinced us to continue keeping the patient in the isolation ICU. Serum aminotransferase levels elevated two months after admission with an AST level of 68 U/L and an ALT level of 123 U/L. In addition, total bilirubin level of 4.0 mg/dL, ALKP level of 228 U/L, and GGTP level of 180 U/L were noted. No hepatosplenomegaly or lymphadenopathy was noted. Other examinations were unremarkable. Computed tomography of the abdomen showed periportal lucency without dilation of the biliary tract or focal lesions. Under the impression of drug-induced hepatitis, all anti-TB agents were halted immediately; however, progressive elevation of liver enzymes and jaundice persisted. Further examinations for hepatitis were performed. A real-time quantitative PCR showed a serum EBV viral load of 1170 copies/mL. Although IgM antibodies against EBV capsid antigen were negative, IgG antibodies against EBV capsid antigen, IgA antibodies against EBV nuclear antigen, and EBV early antigen were positive. One month after the hepatitis onset, fourfold elevation in serum titer of IgG against EBV capsid antigen was seen. Tests for all other antiviral antibodies were negative. Pertinent laboratory data revealed a ferritin level of 338 μg/L (reference, 25-400 μg/L), cholesterol level of 143 mg/dL (reference, < 200 mg/dL), and triglyceride level of 88 mg/dL (reference, 25-150 mg/dL). Peripheral blood study disclosed WBC count of 11.2 × 109/L, hemoglobin level of 13.4 g/dL, and platelets count of 220 × 109/L. The culture of blood, urine, and stools revealed negative results. 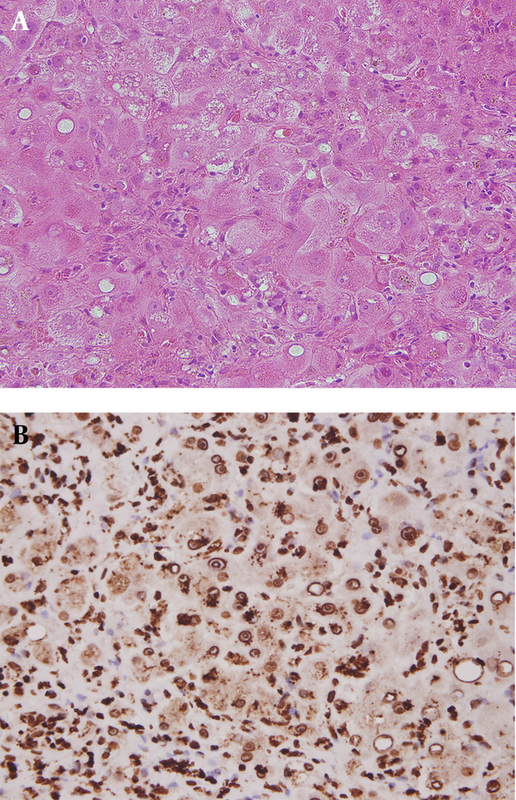 Subsequent liver biopsy showed positive immunohistochemical staining for latent membrane protein 1 (Figure 1). Based on abovementioned clinical presentation, serologic data, and pathologic findings, reactivated EBV hepatitis was diagnosed. Disease deteriorated after liver biopsy. Total bilirubin level rose to 28.9 mg/dL with coagulopathy and hepatic encephalopathy three months after admission. The patient eventually died of hepatic failure complications. Figure 1. A) Hepatitis Characterized by Ballooning Change of Hepatocytes with Marked Lymphocyte Infiltration and Some Hemosiderin Deposition In addition, focal fatty changes and cytopathic effects are noted. B) Most of the lymphocytes in the liver parenchyma are immunoreactive to Epstein-Barr virus latent membrane protein 1. Liver dysfunction develops in up to 54% of patients who are admitted to a general ICU and affects patients' morbidity and mortality (3). Inflammation, infection, metabolic disarrangement, and some therapeutic measures or medications could contribute to liver injury. Our case was initially misdiagnosed as anti-TB agents-induced hepatitis. This was based on epidemiologic data indicating high incidence of anti-TB agents-induced hepatitis in our country, especially in the elderly (4), We halted all anti-TB agents at hepatitis onset; however, hepatitis with jaundice progressed without improvement, which was different from previously reported drug-induced hepatitis (5). Therefore, we performed a series of examinations for possible etiologies of hepatitis and finally, we made the diagnosed of EBV hepatitis based on pathologic and serologic results. Although acute viral hepatitis is an important confounding factor, which clinically, biochemically, and histologically mimics drug-induced hepatotoxicity, cases with viral hepatitis had later onset of acute hepatitis, more significant elevations in hepatic transaminases, and a longer time for normalization of liver function (6, 7). These might serve as useful clues for clinicians when patients presents with liver dysfunction during the anti-TB therapy. In the previous studies, however, EBV hepatitis was not included in differential diagnosis and it was uncertain if it still applied for our case (6, 7). Moreover, a recent literature review found that the elderly patients with EBV infection showed lower rates of clinical symptoms for IMN but higher rates of jaundice, which made the diagnosis more difficult (8, 9). In addition to serologic results and clinical findings, liver biopsy may provide another aid in diagnosis. EBV hepatitis may result from infiltration of infected T cells into the liver parenchyma, which contribute to subsequent liver injury, rather than direct infection of hepatocytes (10). Our presented case prompt clinicians to consider viral hepatitis as a possible etiology after excluding other possibilities during the anti-TB therapy; moreover, they should consider EBV hepatitis when test results for conventional hepatitis viruses return negative. The majority of patients with EBV hepatitis demonstrate a moderate and transient rise in serum aminotransferase levels, which is suggestive of parenchymal injury (2). EBV hepatitis mostly manifest as a mild self-limiting hepatitis and the treatment remains supportive (2). Congenital or acquired disorders of cellular immune response, however, may be responsible for fatal hepatitis and hepatic failure (11-13). We reviewed previous reports of EBV-induced fatal hepatitis in the English language; excluding reports dealing with children (< 18 years old), we found only two cases. The first case was reactivation of EBV fulminant hepatitis, which was associated with high-dose steroid treatment (12). The second case was an elderly patient with primary EBV fulminant hepatitis three weeks after mitral valve replacement surgery, possibly due to anesthesia and surgery, which had depressed the patient’s immune system (13). Based on serology data and high EBV viral load in serum, our case was reactivation of EBV hepatitis. In contrast to the previous two cases in which fulminant hepatitis and then jaundice had developed, our case presented with progressive jaundice and mild elevation of aminotransferase levels. Predisposing factors for reactivation of EBV hepatitis in our case might be related to the anti-TB therapy. Some studies have revealed that hepatic adaptation to anti-TB agents may render hepatocytes more vulnerable to additional new insults (14). Furthermore, we thought that stress from critical illness might have a role in reactivation of the EBV infection as was described in previous literature (15). In conclusion, EBV infection in critically ill and elderly patients might present with an atypical clinical picture and progress to hepatic failure. Clinicians should consider EBV infection in differential diagnosis when hepatitis occurs in deliberated patients. Authors’ Contributions: Ching Hsun Wang took care of the case and wrote the manuscript. Yao-Feng Li contributed to the dealing with the pathology and clinical interpretation. Chih-Hao Shen contributed to take care of the case and to proofread manuscripts.